The missing pyramid of an obscure pharaoh that ruled Egypt 4,300 years ago could lie at the intersection of a series of invisible lines in South Saqqara, according to new astronomical and topographical research. Connecting the funerary complexes raised by the kings of the 6th Dynasty between 2322 B.C. and 2151 B.C., these lines would have governed the sacred space of the Saqqara area, in accordance with a number of criteria such as dynastic lineage, religion and astronomical alignment. "We are talking of meridian and diagonal alignments, with pyramids raised at their intersections. The only missing piece in this sort of grid is the pyramid of Userkare," Giulio Magli, professor of archaeoastronomy at Milan's Polytechnic University, told Discovery News. His research will appear in the next issue of the journal Mediterranean Archaeology and Archaeometry. With photo. Unfortunately not big enough to see the hieroglyphs. An Egyptian excavation team has unearthed a 3,500-year-old door to the afterlife from the tomb of a high-ranking Egyptian official near Karnak temple in Luxor, Egypt's Culture Minister Farouk Hosni announced on Monday. Engraved with religious texts, the six-foot-tall red granite door belonged to the tomb of User, the chief minister of Queen Hatshepsut, the long-ruling 15th century B.C. queen from the New Kingdom. The door, known as a false door, was meant to be a threshold that allowed the deceased and his wife to interact with the world of the living. This "interaction" was not eternal for User. More than 1,000 years after his death, during the Roman period, the massive false door was removed from the tomb and used in the wall of a Roman structure. The uncle of the well-known Rekhmire, who was King Tuthmosis III's chief minister, User was a powerful man. Archaeologists have unearthed a 3,500-year-old door to the afterlife from the tomb of a high-ranking Egyptian official near Karnak temple in Luxor, the Egyptian antiquities authority said Monday. These recessed niches found in nearly all ancient Egyptian tombs were meant to take the spirits of the dead to and from the afterworld. The nearly six-foot- tall (1.75 meters) slab of pink granite was covered with religious texts. The door came from the tomb of User, the chief minister of Queen Hatshepsut, a powerful, long ruling 15th century B.C. queen from the New Kingdom with a famous mortuary temple near Luxor in southern Egypt. User held the position of vizier for 20 years, also acquiring the titles of prince and mayor of the city, according to the inscriptions. He may have inherited his position from his father. I've only posted the two most important news items today because right now I'm supposed to be driving from one side of Wales to the other for a short break at the coast. Somehow things have become a little fraught on the planning front! I'm not sure if I'll be able to update the blog for the next few days but I'll give it a shot. beyond the hypostyle hall at New Kalabsha. anyone got any better information? The Governor of Luxor Samir Farag said the city's development is a work in progress, and that the government "will remove anything that stands in the face of development, even if it is a mosque or a church." He added, "we are working according to a development plan which will end in 2030, and no one will threaten me, or force me to leave the track, because I am like a train." Speaking at a symposium hosted by the Heliopolis Lions Club chaired by Safia Metwally, he added, "No one can scare me. No one is more important than the government, and I will not be threatened by the media or the press." I stopped posting travel articles a while ago, but every now and again one turns up that looks as though it might be worth sharing and this is one of them. It shows the sort of optimism, sense of untrammeled adventure and willingness to trust that I simply don't have about travel and people I've never met before. Once in Asyut, I walk to the bus station and jump on the next bus to Kharga. The bus is extremely dusty and sandy. As we start moving, I feel like someone has thrown a bucket of sand in my face and down my throat. On the bus a gentlemen sits down in the row opposite me an invites me to join him for a chat. I sit down next to him and we begin to talk. Conversation is slow due to his limited English but I can tell he is a kind and genuine fellow. He likes travellers and relishes the opportunity to practice his English. He tells me of his dreams to one-day open a hotel and restaurant for tourists. After getting to know each other, he invites me back to his place and offers to take me around the oasis the next day. I happily accept and look forward to meeting his family and perusing the oasis. Before the three-hour trip is over, he passes me what appear to be tiny apples. They look exactly like mini granny smiths and taste how you would image a little apple would, the same but slightly more sour. The landscape along the way is nothing short of amazing. I catch my first real glimpse of the smooth untouched dunes of the Sahara. I feel an immediate peacefulness come over me, it is as if my heart rate just suddenly drops to 30 beats a minute. I only see small tracts like this but I now have a taste for what the next week might be like. I am dropped at my near my accommodation in Kharga and after a little aimless wandering around the empty and slightly eerie streets (I don’t have a map of the town) I find the Hamadalla Hotel. It’s an interesting establishment, it reminds me of a dusty, dingy and deserted hospital but with carpet and no patients or doctors. Every toilet in the quiet large hotel seems to be leaking, it’s a little weird. The bathrooms are so grimy I decide not to take a shower as I feel I will be dirtier after. I am pretty sure I am the only one staying in the entire hotel. Hey, for $8 AUD it’s all good. See the above page for the full post. If you liked this one have a look at his experiences of the White and Black Deserts (Farafra to Bahariya, with some excellent photographs), Bahariya (with more photographs), Dakhleh (yet more great pics). I stumbled across this page by accident. Tell el-Da'ba is in the eastern Delta on the Pelusiac branch of the Nile and has now been identified as Avaris, the Hyksos captial. The satellite photograph of the site on the above home page is marked with green areas on which you can click to read details of the excavations at those locations. There are detailed descriptions and photos throughout, and the History page gives an overview of the site's background and chronology. Also in German. The first and only guidebook to the Gilf and Uweinat. Alberto Siliotti is a scientific journalist who specializes in Egyptology. He has written several books including The Discovery of Ancient Egypt (AUC Press, 1998), The Illustrated Guide to the Pyramids of Egypt (AUC Press, 2003), and the popular series of Egypt Pocket Guides. The Get Involved/How To Give section of the OI's main website offers an opportunity to contribute to Egyptology by donating to the excavations at Tell Edfu. An overview of the site and the work carried out so far is provided. Tell Edfu, one of the most well-preserved ancient towns in Egypt, houses the remains of what once had been the capital of the 2nd Upper Egyptian province. Continuous occupation over several millennia led to the constant build-up of settlement layers, creating an artificial mound, or a tell, of considerable height. Tell Edfu is one of the rare places where nearly three thousand years of ancient Egyptian history are preserved in the stratigraphy of a single site - therefore, it provides an enormous potential for increasing our understanding of ancient urbanism in Egypt, a topic that is still poorly understood since it relies almost entirely on archaeological data. Few ancient Egyptian settlement sites are currently accessible and even fewer have been excavated and published. The past excavation seasons at Tell Edfu have focused along the eastern part of the tell, which yielded evidence for the early administrative center of the town. The first finds by Dr. Nadine Moeller and her team have already proved to be spectacular, such as the large grain silos that are so far unique in the Egyptian archaeological record. For the first time, it has been possible to discover archaeological settlement remains that complement the already abundant ancient administrative textual sources. The budget for each field season at Tell Edfu is spent mostly on airfares and salaries for specialists - such as zoologists, archaeo-botanists, and ceramicists - and workers. Further research and analysis of new data, such as taking samples for radiocarbon dating, and post-excavation work after each field season, like preparing materials for publication, are parts of the project that are currently underfunded. Adopting Tell Edfu as a dig can increase the output possibilities of the project by funding more researchers and providing for efficient and accurate data processing after each season. Thanks to Amigos de la Egiptologia for the link to the above story. COMO UNA SUCESIÓN de tesoros se ha organizado la exposición El enigma de la momia. El sarcófago exterior de Seramón, en la vitrina donde se expone. La momia de Seramón, envuelta con las vendas tal y como fue encontrada hace 150 años en Tebas. La comisaria de la muestra, Agathe Mathiaut-Legros; el presidente de la Diputación, José Joaquín Ripoll, y el gerente de la Fundación CajaMurcia, Pascual Martínez, observan algunas piezas. Lejos de ser un final, para los egipcios la muerte no era más que el principio de un camino hacia el más allá, el trayecto hacia otro mundo que suponía el reflejo idealizado de su vida terrenal. Esta reflexión da una idea de por qué esta cultura daba tanta importancia a los enterramientos, por qué surgió en esa civilización la técnica de embalsamar los cuerpos y por qué el engalanamiento y el lujo en sus muertos era símbolo de poder. Muchas respuestas a estas preguntas son las que ofrece la exposición El enigma de la momia, que se inauguró ayer en el Museo Arqueológico de Alicante (MARQ) para abrir las puertas al mundo egipcio con una muestra única, que incluye 250 piezas, procedentes principalmente del Museo de Louvre y del de Beçanson. A line up of treasures make up the new exhibition, The Enigma of the Mummy including the outer sarcophagus and the mummy of Seramon, preserved just as he was when discovered in Luxor. Far from being the final stage in life, for the Egyptians death was just the first step in a journey to a far more distant place which was an idealized version of life as it had been lived. This understanding gives an idea of why this culture gave so much emphasis to the burials, why civilization emerged in the art of the technique of embalming bodies was perfected and why the luxury for their dead was a symbol of power. Many of the answers to these questions are provided by the exhibition which opened yesterday in the Archaeological Museum of Alicante (MAEQ). The unique display includes 250 items loaned principally from the Louvre and the Beçanson in France. Some of the perfumes that were used during the process of mummification have been reproduced and are there to be sampled. Laura Miguélez Cavero, Poems in Context: Greek Poetry in the Egyptian Thebaid 200-600 AD. Sozomena. Studies in the Recovery of Ancient Texts 2. Berlin/New York: W. De Gruyter, 2008. A panoramic study of Greek Epic in Late Antique Egypt, such as this recent book by Dr Laura Miguélez Cavero, published as a result of her 2006 PhD dissertation at the University of Salamanca, was much needed in this field of research. Greek Poetry in the Egyptian Thebaid, as the title goes,--or, rather, epic, since lyric or drama are let aside--is a very valuable piece of scholarship, as we shall point out in the following lines. First of all, let us summarize the contents of the present volume. Poems in Context is divided into 5 chapters, the first one providing an analysis of "The so-called school of Nonnus in the literary context of Panopolis (3rd-6th c. AD)" and of some of the main figures of this long period of time (the family of Fl. Horapollon, Cyrus, Olympiodorus, Nonnus and Musaeus). Miguélez Cavero argues for the non-existence of a "School of Nonnus" or something similar explaining this Egyptian "poetic flourishing" ("that would force into a category a certain number of poets whose purpose surely was not to create a group", p. 5). She also emphasizes the idea that the most important work of this period, the Dionysiaca, "did not emerge in a thematic vacuum" (p.22). Both ideas are important and thoroughly discussed in the book and we shall go back to them. AnneMarie Luijendijk, Greetings in the Lord: Early Christians and the Oxyrhynchus Papyri. Harvard Theological Studies 60. Cambridge, Mass. : Harvard Divinity School, 2008. The city of Oxyrhynchus has attracted the attention of scholars in early Christian studies since the first archaeological season of Grenfell and Hunt on the site (1896-1897), which, amongst others, brought into light the Greek original of what came to be known about fifty years later as the Gospel of Thomas (P. Oxy. I, 1). From that moment onwards the ancient rubbish heaps of the city have given to us a wide range not only of Christian literature, but also of documents -- such as letters, lists and contracts -- relating to the everyday life of Christians and Christian institutions in that city and its neighbourhood. AnneMarie Luijendijk's "Greetings in the Lord" is an updated and well-structured presentation of the papyrological material relating to early Christianity from the site. The book, mainly addressed to students and scholars in early Christian studies, is divided into three parts ("Meeting Christians at the Marketplace"; "Papa Sotas, Bishop of Oxyrhynchus"; "Legal matters and Government Dealings"), preceded by a general introduction ("Destination Oxyrhynchus: Historical Detective Work in the Footsteps of Monks and Papyrologists") and ended by a concluding chapter ("Early Christians in the Oxyrhynchus Papyri: New Voices in Ancient History"). The deity Mandulis/Merwel with lotus flowers. Mandulis was a Lower Nubian deity often associated with Horus. Here he is shown in the form of a falcon with a human head, with his elaborate crown. No news today except for the fact that the blog is 6 years old today and I am 46. Ouch! As a whole last year was a pretty horrid affair. and I was glad to turn my back it. My father celebrated the end of 2009 by breaking his ankle on New Year's Eve! Says it all really :-). But in spite of the hours spent in Accident and Emergency in north Wales (an interesting anthropological experience in its own right) we are both feeling that 2010 is already a much better place to be. I am very much enjoying working on the online magazine with Kate, and most of my other projects have come back to life too. Looking ahead, my father and I are booked into one of Jane's apartments in Luxor for two weeks at Christmas this year, which we are both looking forward to SO much! Do get in touch if you're planning to be there at the same time. I would like to offer serious thanks to all those who emailed and posted comments in September last year when I was going through a seriously bad patch and fell of the face of the planet. I was quite unable to respond at the time but you cannot believe how all your comments motivated me to get off my backside, stop feeling sorry for myself and re-join the real world. I would almost certainly have given up the blog without all of you, and that would have been a bad thing for me. So . . . . . .
Vincent Brown remarked to me a couple of weeks ago that blogging builds communities of people who have never met, and recently Kate Phizackerley posted to her visitors a thank-you message for making her blog a real living community. I too have plenty of experience of having great online conversations with visitors with whom I have never met. A blog seems like such a static thing until people start responding and discussing matters and offering moral support, and then it seems anything but static or abstract. There's nothing abstract about a web community! It is something that continues to surprise and really delight me. I hope that the magazine will build on that and encourage even greater involvement. I am up in Wales with my father, with a case of Pouilly Fume, another of Rioja and a bottle of pink Champagne. It's promising to be a very good extended birthday! Is it just me or is 2010 flying past at a staggering rate? I cannot believe we are at the end of March already. Perhaps it's just a sign of getting old! A lot of questions have been raised by the recent announcement by the Egyptian Supreme Council of Antiquities (SCA) of the results of DNA tests on certain of the royal mummies in the collection of the Egyptian Museum, Cairo. Here I outline both developments leading up to the publication of the results, and the discussions that followed. Those wishing to read more detailed discussions of the background evidence on the royal mummies may do so in my book Identifying the Royal Mummies, references to which are provided in the notes. The Egyptian SCA had always resisted calls for the DNA testing of mummies,1 until it could be performed in Egypt, and in June 2007 a DNA laboratory was attached to the Egyptian Museum, Cairo. As a second laboratory was required to validate the results, another was constructed nearby at Cairo University, opening in June 2009. The construction of the second lab was partly prompted by the scepticism over the value of DNA tests conducted at the time that one of two female mummies from tomb KV60 was identified as Hatshepsut. The two KV60 females were found laid-out with the left hand on the chest and the right arm straight down by the side – a pose sometimes believed to be associated with queens – and the association with Hatshepsut was made because one of the mummies lay in a coffin base bearing the title and name, ‘Great Royal Nurse, In’, who might be the same In-Sitre, a wet-nurse of Hatshepsut, known from a statue discovered at Deir el Bahari. For more information about Dylan Bickerstaff see the biography on his website. There is not, and has never been, another city to match it. It was a glittering metropolis, home to the most sexually charismatic queen of all time, founded by a man whose megalomaniac ambitions knew no bounds. It was a buzzing hub that boasted one of the seven wonders of the world, where intellectual geniuses from both East and West met to tussle and debate in a library containing all the knowledge on the planet. Founded more than 2,300 years ago, and in its hey-day one of the most powerful places in the world, this is now a lost city, most of it buried beneath waves off the coast of modern Egypt. This is the city of Alexandria. By rights, Alexandria should be a household name, as famous as Athens or Rome. Make no mistake, this was a metropolis as beautiful as Paris, as creative as London, as hip as New York and more learned than Harvard. And yet, as I discovered while researching a new documentary, somehow this amazing urban experiment is just a footnote in history. Luckily for us, the secrets of this wonder of the ancient world are being unearthed, as archaeologists uncover more and more from its lost treasures. Kate has posted an update on progress with our online Egyptology magazine. I mentioned the word "hieroglyphs" to her a couple of weeks ago - and then I ducked for cover. I was going through my hieroglyph flashcards one morning and suddenly had the ghastly thought that we would have to find some way of dealing with articles which display and/or discuss hieroglyphs on our magazine website. I really should have thought of this before and cannot think why I didn't. Kate is as usual on the case with her usual and completely impressive can-do attitude. See her update for more on this topic. Oh, and Kate is not joking about the colour schemes. It is the same as in the days when I used to manage website builds. As a team you present the whizzy new all-singing and all-dancing web presence, representing months and months of work, to the board of directors and wait with baited breath whilst they consider the pros and cons of your presentation and then one of them says firmly "but I don't like that shade of green". Kate and I are really struggling to find colour schemes which work with our content and with which we can both live happily. A symposium was held yesterday at the Egyptian Museum by prominent author Youssef Maati and Engi Fayed, office manager for cultural development of the Supreme Council of Antiquities. The symposium, which lasted for almost two hours, focused on the relationship between Pharaonic history and Maati's literary works including his movies, plays and books. Most of Maati's works are influenced by Pharaonic civilization, Maati said, adding, "I used to work as a tour guide for a long time before starting my writing career, which instilled in me a profound appreciation for Pharaonic heritage." This is not an article about Petrie but it is a short biography (excerpt below) with links to relevant articles on Heritage Key about Petrie and about the Petrie Museum of Egyptian Archaeology in London, UK. Sir William Flinders Petrie was one of the most revered Egyptologists in history, and a pioneer of systematic methodology in archaeology. He already had exploration in his blood before his birth in 1853; his grandfather was one of the first men to chart Australia. Whilst a child, his mother introduced him to Hebrew, Latin and Greek - which helped nurture his later obsession with the ancient past. As a young man Petrie developed a taste for geometry and engineering, spurred on by his industrial engineer father. Later on he would allude the building of Stonehenge with that of the Great Pyramids at Giza, and speculated that pi must have been used in their development. His 1883 book The Pyramids and Temples of Giza still remains a key text on the subject of the structures' construction and measurement. He then carried on his work at Tanis, Sehel and Fayoum - by which time he was already famous for discovering a great number of steles and pottery. Stan has posted a profile of the MCC Museum, located on the Emory University Campus in Atlanta, Georgia. Here's a short excerpt, describing the Egyptian, Nubian and Near East collection. These galleries are especially striking and beautifully showcase an excellent collection of the ancient art from this region, the finest in the American Southeast. Perhaps the most dramatic objects exhibited are 10 magnificently decorated Egyptian wood coffins, displayed to good effect at table height and accessible for close viewing. Additional treasures include a sculpture of Pharaoh Tutankhamun as a child, canopic jars, jewelry, amulets and statuary. Again, side galleries are used to display groupings of smaller artifacts in an appropriate setting. Thanks to the Amigos de la Egiptologia website for the link to the above interview with José Miguel Parra..
En Egipto, un estudio genético de la momia de Tutankamón acaba de desvelar que era hijo del faraón hereje, Akenatón, y ha desmitificado su imagen juvenil y bella. En Nueva York, el Met exhibe los objetos utilizados para su embasamiento. En Barcelona, el hospital Quirón acaba de reconstruir el rostro de una momia de la época del Fayum y el Museo de Arqueología muestra los rostros de 18 momias abandonadas en Tebas. En Alicante, otra exposición más revela los secretos de los ritos funerarios egipcios. Parece que las momias vuelven a estar de moda, si es que en 5.000 años dejaron alguna vez de estarlo. Y, si no, que se lo digan al arqueólogo José Miguel Parra, que se suma a la tendencia con el libro divulgativo Momias. Not specific to Egyptology but may well be of use here as elsewhere. Having spent part of an afternoon under a black-out sheet with a carved rock, a fellow archaeologist and a high powered torch each to try and work out the patterns carved into the weathered surface I can well appreciate the potential of the technique!! LOOK at an ancient coin under ordinary light and the chances are that its features, worn down by its passage from hand to hand, will be hard to make out. Point a spotlight at it, though, so that the face of the coin is illuminated from an acute angle, and the resulting shadows will emphasise any minor details. This is the basic principle behind a novel technique that is helping archaeologists reveal previously invisible clues hidden in the worn or damaged surfaces of any objects they uncover. From wall paintings in Herculaneum to Scandinavian stone tools to rock art in Libya, polynomial texture mapping, as the process is known, is proving an invaluable way to illuminate the past. The lighting method was originally developed by Tom Malzbender, a computer scientist at HP’s laboratory in Palo Alto, California, to generate better 3-D imagery for computer games. In its most basic form, the process involves capturing between 30 and 50 digital photos of an object of interest. The pictures are taken from directly above the object in a darkened room. Though the camera is fixed, the object is lit from a different angle in every shot. The photos are then combined on a computer to create an image that can have a “virtual” light shone from various angles to reveal any hidden surface detail. 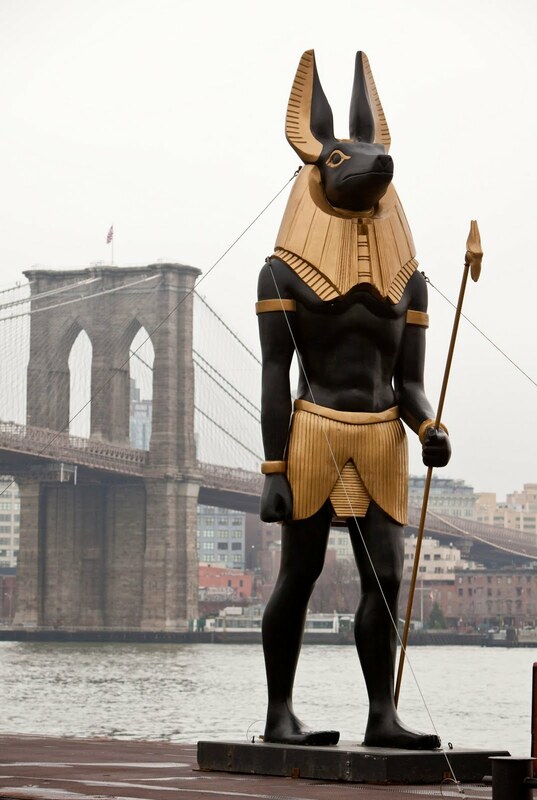 Stan Parchin, Publisher and Editor-in-Chief of Art Museum Journal, was the only member of the staff of Treasures of Tutankhamun at The Metropolitan Museum of Art (1978-79) to attend the arrival of the gigantic statue of Anubis in New York Harbor on March 23, 2010. 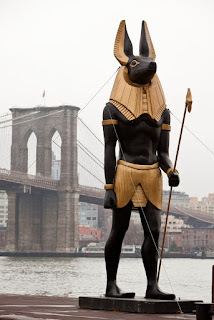 The sculpture is in New York in anticipation of the expanded version of Tutankhamun and the Golden Age of the Pharaohs at Manhattan's Discovery Times Square Exposition (April 23, 2010-January 2, 2011). Tickets went on sale the same morning. They may be purchased at www.kingtutnyc.com (just click on the "buy tickets" tab). Here are the photographs that Stan has forwarded to me for sharing! With thanks too to Chris Lee. 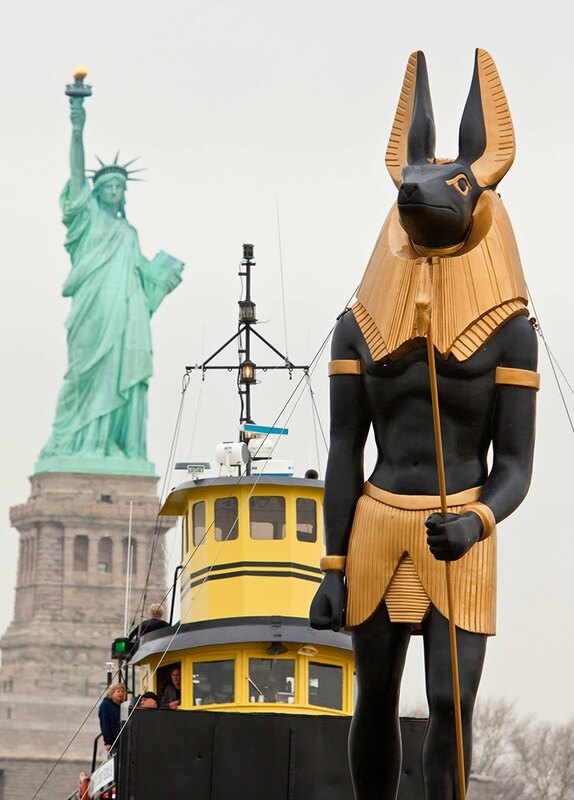 News report and video of Anubis on board a boat visiting the key water-side sights of New York including the New York sky-line, the Brooklyn Bridge and the Statue of Liberty, all to mark the first day of ticket sales for Tutankhamun and the Golden Age of Pharaohs at the Discovery Times Square Exposition. All great publicity for the exhibition, and more than a touch of humour into the bargain! The avenue of rams is on the fast track to be completed in three years though UNESCO wanted a twenty year restoration. Here we have an article on the rough eviction of a Anglican pastor his wife and small child to demolish their home and the churches property to make way for the avenue. That's what Mussolini did in his efforts to get down to the imperial remains of Rome as fast as possible leaving everything in the path destroyed simply to achieve his twisted vision of history. With photos. Thanks to Jane Akshar's Luxor News Blog for the link (where a comment has already been left in response). In addition to the swelling number of tourists, another revolution is taking place, one not imaginable by those who have previously visited Luxor. In a move to make the ancient sites more accessible and facilitate the movement of tourists, the main streets have been widened by removing hundreds of buildings, including private houses and shops. Walls have been erected that often shut off the buildings that remain. To make the major temple sites more "attractive," large empty plazas and rows of badly designed shops have been created, again by removing many of the former occupants and their businesses. The long avenue of sphinxes that connected Luxor and Karnak Temple in the past is being excavated, apparently in great haste, even where it passes under major areas of the city. Many of the sphinxes are so badly damaged they are unrecognizable, raising the question as to the value of the whole operation. Should the Rosetta Stone go back to Egypt? Anyone who managed to miss the flurry of media interest and discussions in December and January about whether or not the Rosetta Stone should be returned to Egypt can find a summary of the situation on the above page. David Gill (Department of Classics, Ancient History and Egyptology at Swansea University, Wales) has a look at whether Egypt has a legal right to the return of the object and explains his personal position on the subject. Dr Zahi Hawass has been mounting a case for the return of the Rosetta Stone along with other significant Egyptological pieces such as the head of Nefertiti in Berlin. Is there a legal case to return the Rosetta Stone? 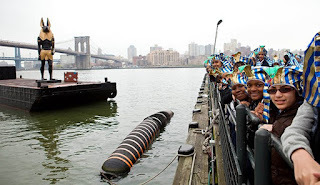 The benchmark international agreement is the 1970 UNESCO Convention on on the Means of Prohibiting and Preventing the Illicit Import, Export and Transfer of Ownership of Cultural Property. The United Kingdom became a signatory in 2002. Sean Williams argues that given the involvement of Lord Carnarvon, Howard Carter and other British team members some of Tutankhamun's tomb discoveries ought to have found their way into the British Museum on long term loan. When I'm strolling through the British Museum's Egyptian Sculpture Gallery taking in its ancient statues, stelae and scriptures, it's hard not to think something's missing. For among its rows of exotic artefacts, nothing on display relates to Egypt's most famous king in modern times, Tutankhamun. And I think Britain deserves to have kept hold of at least some of the ancient world's greatest pieces. If you're interested in this topic keep an eye on the above page because the suggestion is almost bound to result in a discussion of the pros and cons. 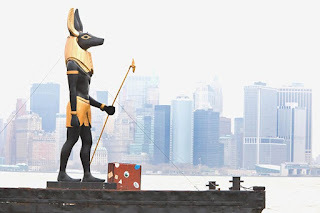 You live long enough in this city and you'll see things you couldn't even imagine - like a 25-foot tall Anubis statue being towed around New York harbour, which is what happened on yesterday morning. 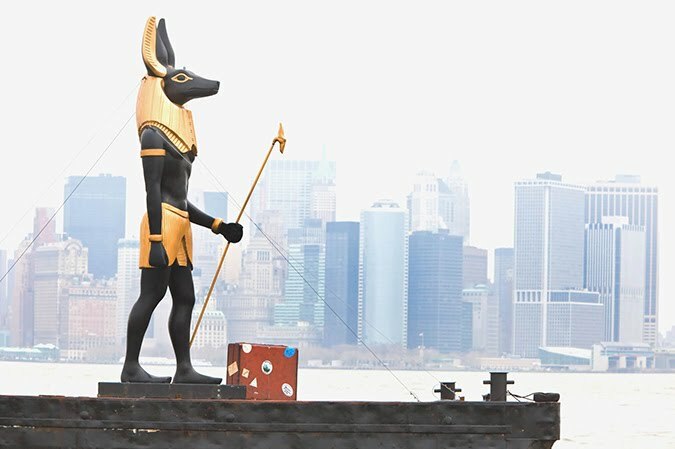 Anubis's arrival heralds the one-month countdown point for the exhibition, Tutankhamun and the Golden Age of the Pharaohs, which opens April 23 at the Discovery Times Square Exposition in Manhattan, on the final leg of its journey round North America. Tickets for the show went on sale the same day. Scientists have developed a new method to determine the age of ancient mummies, old artwork, and other relics without causing damage to these treasures of global cultural heritage. Reporting at the 239th National Meeting of the American Chemical Society (ACS), they said it could allow scientific analysis of hundreds of artifacts that until now were off limits because museums and private collectors did not want the objects damaged. "This technique stands to revolutionize radiocarbon dating," said Marvin Rowe, Ph.D., who led the research team. "It expands the possibility for analyzing extensive museum collections that have previously been off limits because of their rarity or intrinsic value and the destructive nature of the current method of radiocarbon dating. In theory, it could even be used to date the Shroud of Turin." . . . . I recently visited the Deir el-Bahari cache, which is a very difficult tomb to enter. It is down a 15-meter deep shaft, and you must be lowered down by rope into the shaft. From the vertical shaft is the entrance into the tomb: a few stairs down into a roughly cut passage through the rock, which leads to more stairs and ends in a large room where the royal mummies were hidden by priests in the 21st Dynasty. Now we close up the entrance to the tomb so that no one may enter, although there is nothing left inside. The reason for this is to show the importance of this tomb, because inside was found one of the most important discoveries, which is, in my opinion, even more important than the discovery of the tomb of Tutankhamun in 1922. The story of the discovery of this cache is amazing. A young man named Ahmed, a member of the famous Abdel Rassul family was leading his goats in the hills near the temple of Hatshepsut at Deir el-Bahari, when one of them escaped. The main thrust of the lecture was the difficulty of presenting epigraphic work and used a lot of computer drawn slides to illustrate his points. This makes it a bit tricky to record on the blog. I will limit myself to the non technical aspects of the lecture which unfortunately make it a bit sparse. The computer bits were quite clever basically by colouring in the epigraphic work in different colours then the software can remove a coloured layer. So you can remove the damage, or the text or the line or the drawings in order to concentrate on the aspect of most interest to you. Nefermenu was the Mayor of Thebes in the second part of XIX dynasty. His wife was Meryt. This tomb shows the change in the cultic practice around the naos. My work in the Wilbour Library involves keeping an eye out for books the Library needs, and carrying out archival research into the history of the Egyptian collections in support of the Library’s educational mission. In the Library’s Special Collections I’ve been particularly intrigued by a small group of eighteenth century drawings of Egyptian objects. These were probably made by the German artist Johann Justin Preissler (1698-1771), and provide a rare glimpse into early studies of Egyptian objects. At the time Preissler made his drawings, Egypt was an inaccessible, mysterious land. Few objects were held in Western museums or collections, and hieroglyphic inscriptions could not be read. Preissler’s drawings are of interest not only because they record objects that may now be lost or damaged, but also because they show how these Egyptian objects appeared to an eighteenth century eye. South African author Marié Heese won the Commonwealth Writers' Prize, Africa Region Best Book for The Double Crown: Secret Writings of the Female Pharaoh (Human & Rousseau). It is the story of Hatshepsut, as told by the pharaoh herself. This is an extract. I am the chosen of the gods. I have always known that. This knowledge has been the source of my strength and my power, and it is the reason why I know that those who now seek my death and desire to usurp my throne shall not succeed. Yet I have decided that I must make a secret record with details about those whom I do not trust. I shall give the scrolls that I produce into the keeping of my scribe, the faithful Mahu. If I die a wrongful death, he must hand them to someone in power who will avenge me. Mahu will have to decide who the right person might be. I shall ensure that there will be sufficient evidence to see to it that the guilty, if such there are, suffer the just punishment of the gods and do not reap great benefits from treason. In the first part of January the media began breaking the news that the old yarn about slaves having built the pyramids had finally been dispelled. Dr. Zahi Hawass of Egypt’s Supreme Council of Antiquities announced that three large tombs had been newly discovered very close to the pyramid itself. As the final resting place of some of the overseers of the workforce, both the structure and location of the tombs made it clear that these were no slaves. Dr. Hawass’ statement that “These tombs were built beside the king’s pyramid, which indicates that these people were not by any means slaves” (source) was widely repeated in the press under headlines announcing that the belief that slaves had built the pyramids could now be retired. But Egyptologists have long known that the Slave Hypothesis was pure Hollywood. 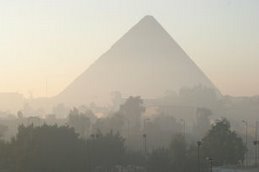 Along with Hawass, Egyptologist Mark Lehner began uncovering the truth of the pyramid builders more than 20 years ago. Lehner was consumed with the question of where such a large workforce could have lived. After conducting the first detailed “to scale” survey of the Giza Plateau, he narrowed his focus to the area around the enigmatic Wall of the Crow, a colossal wall with no apparent related structures. Lehner hit pay dirt, and his dogged pursuit of these ancient builders led to the excavation of the very city where they lived and worked—a large complex of barracks and permanent housing, distribution centers, industrial sites, and scribal workshops. The recently discovered tombs tell us something of the status of the workers, but the Lost City of the Pyramid Builders gives us the everyday details of their lives. Most of Em Hotep’s readers will be familiar with Dr. Lehner and his work. But if you are not, then his total absence from the recent news stories may have left you with an incomplete picture of just how strong the case against the Slavery Hypothesis really is. In this three-part series we will take a look at what Lehner discovered about the pyramid builders. We will examine the evidence that the workforce had a surprisingly modern division of labor, followed by a tour of the city itself. The full text is not available online without subscription, purchase or institutional access. To the Editor: In their Research Letter, Dr Allam and colleagues described the presence of calcium hydroxyapatite in vessel walls in 15 of 22 ancient Egyptian mummies examined with whole-body 6-slice computed tomographic (CT) imaging. The authors stated that "[c]alcification in the wall of a clearly identifiable artery was considered diagnostic of atherosclerosis, and calcification along an artery's expected course was considered probable atherosclerosis." We believe that this criterion was incorrect. And the reply . . .
Drs Charlier and Huynh propose that mediasclerosis is a unique disease, manifest as calcification of the tunica medica, a disease completely different from atherosclerosis, which they presumably would define exclusively as a disease of the intima. We believe that atherosclerosis is a multifaceted, systemic disease that encompasses both of these histologic features. The earliest pathologic manifestations of atherosclerosis include intimal thickening and fatty streaks, but complex changes occur as the disease progresses, with structural remodeling of the vessel, cellular infiltrates, lipid accumulation, thrombosis, fibrosis, and calcification involving the media as well as the adventitia. I cannot believe that I am again advertising a Twitter site! It is good to see that there are a growing number of archaeological projects using Twitter and other online applications as a quick way to keep people updated. Jo Rowlands is posting updates about the work of the Egypt Exploration Society's Minufiyeh Survey currently taking place in the Delta. There's a page on the EES blog with details of the project. An excellent review of the exhibitions, with photographs. Tutankhamun's Funeral in the spacious first-floor Egyptian Special Exhibitions Gallery at The Metropolitan Museum of Art (March 15-September 6, 2010) highlights some 60 artifacts that describe the mummification and religious rites that occurred upon the death of the adolescent New Kingdom pharaoh. The majority of them, given to the museum by archaeologist Theodore Davis (1837-1915) in 1909, eventually led to the discovery of the boy-king's tomb by Howard Carter (1874-1939) in 1922. The installation is supplemented by pertinent loan objects, vintage site photographs and facsimiles of wall paintings that illustrate ancient Egyptian funerary rituals. Institute of Egyptology and Coptic Studies, Göttingen, June 9th to 12th 2010. This website is effectively the brochure for a seminar, but it has some useful information in its own right. A central issue of Egyptological research is the question of dating the original composition of religious or literary texts. However, re-dating might amount to a downright re-writing of parts of the Egyptian cultural history. Very prominent is a lively debate about the date of composition of a number of literary texts, traditionally dated to the First Intermediate Period or the Early Middle Kingdom but known only from New Kingdom manuscripts. Over the last forty-five years, several attempts have been made to date the production of some of these texts much closer in time to their first physical appearance. Using religious, cultural, linguistic, or textual arguments scholars have argued for a New Kingdom origin (Admonitions: van Seters 1964 (» list of readings); Hymn to the Nile: van der Plas 1984; Merikare: Bickel 1994; Amenemhet: Grimal 1995; Loyalist [Kaires]: Schipper 1998). More recently the discussion has heated up considerably with contributions that argue for a New Kingdom origin of Merikare, Neferti, Khakheperreseneb and Amenemhet with the reassessment based on conceptions of Egyptian cultural history (Gnirs 2006; eadem in press) or on linguistic analysis (Stauder, in press). On the other hand, there is an equally strong tendency to oppose any later datings which bases itself on the very same categories of arguments (for example Amenemhet: Burkard 1999; Merikare and Neferti: Burkard/Thissen 22007) and a general attitude to take the oldest linguistic layer of a text as a direct indication of its time of origin (von Lieven 2006). This lovely book was written by Dorothea Arnold in conjunction with the exhibition "Egyptian Art in the Age of the Pyramids" at the Galeries Nationales du Grand Palais, Paris from April 6 to July12 1999; The Metropolitan Museum of Art, New York from September 16 1999 to January 9 2000; The Royal Ontario Museum, Toronto from February 13 to May 22 2000. The photographs by Bruce white are wonderful images of so many old kingdom objects I have never seen before and a few old favorites as well. I confess from the start that old kingdom art really does it for me especially by when the book lets the large often full page images do the talking. Villagers from southern Egypt's Luxor are suing the state over plans for a port on the site of nearly 2,000 homes, a lawyer representing them said on Tuesday. The estimated $1-billion port aims to provide docks for more than 180 Nile cruise boats as part of a project to revamp Luxor, the site of ancient Thebes, whose antiquities attract hundreds of thousands of tourists every year. The port would take 500 feddans (210 hectares) of land from villagers in el-Maris and displace at least 10,000 people, said residents who oppose the plan despite promises of compensation. Su currículo nos dice que estamos ante un 'galáctico' de la egiptología, y su conversación, que disfruta con verdadera pasión de cada uno de los avances realizados en los últimos nueve años que ha durado su última misión: el 'proyecto Djehuty'. «Djehuty era el supervisor del Tesoro, una especie de ministro de Hacienda de aquella época encargado de controlar el oro y la plata». José Manuel Galán (Madrid, 1963) es investigador científico del CSIC. the king being purified by Thoth and Horus. The Minister of Culture, Farouk Hosni, announced that two red granite statues of King Amenhotep III and of the god Thoth, were unearthed near the Pharaoh’s funerary temple at Kom el-Hettan on Luxor’s west bank. Dr. Zahi Hawass, Secretary General of the SCA, said that the first statue depicts the 18th Dynasty king, Amenhotep III, together with the god Re-Horakhty, while the second statue represents the god of wisdom, Thoth, in the form of a baboon. A huge, calcite statue fragment possibly dating to the reign of Amenhotep III, was also found. Mansour Boriak, General Supervisor of the Luxor Antiquities Department of the SCA, added that excavation work is ongoing in order to discover further statues which once stood inside the temple at Kom el-Hettan. “If you want to be perfect, go, sell what you have and give to the poor, and you will have treasures in heaven; and come, follow me.” Way back in the third century, a man from Upper Egypt named Anthony took these words of Jesus quite literally and turned his life upside down. In 285, at the age of 34, Anthony gave away some of his family’s estate to his neighbours and sold the remaining property, donating the funds thus raised to the poor. He placed his unmarried sister with a group of Christian virgins in a type of proto-nunnery, and he himself became the disciple of a local hermit. Leaving the place of his birth, he headed towards the settlement of town Zafarana on the Red Sea coast. There he took up a residence in a cave at the foot of the nearby mountains, with little more than a spring and a cluster of date palms to sustain him. Anthony now dedicated his life to trying to implement the words of Jesus, and he became the first known Christian ascetic and the spiritual father of all monks. Upon his death in 356, his followers built cells for themselves which formed the core of what was to become a large monastery bearing the saint’s name. If anyone is interested I've written a short "armchair introduction" to the Coptic religion on one of my other blogs. The upper house of Egypt’s Parliament approved an agreement on Sunday that was signed with Ecuador in 2008 and opens the way for the recovery of antiquities stolen and taken illegally to the South American country, the official MENA news agency reported. Egypt and Ecuador, under the terms of the agreement, ban and criminalize trafficking in ancient, cultural, art and historical items stolen from either country. Anachronism is the despair of the historian. Though it is easy to correct the misdating of objects and events, it is a lot harder to root out the intuitively appealing idea that the people in the past were somehow "aiming" at the people in the present us. George Bernard Shaw, in his notes to his play "Caesar and Cleopatra," wrote, "The more ignorant men are, the more convinced are they that their little parish and their little chapel is an apex which civilization and philosophy have painfully struggled up the pyramid of time from a desert of savagery." Yet Shaw's play is a case in point. His Cleopatra is more like some Edwardian teenager than the plurilingual incarnation of the goddess Isis, which Cleopatra was firmly convinced she was. The hardest task for artists or historians is to efface the thumbprint of their own time when they handle times past. Two recent biographers of legendary ancient monarchs Cleopatra and Mithradates have found different solutions to the anachronism problem. Duane Roller has sought to build a portrait of Cleopatra "based solely on information from the ancient world," and Adrienne Mayor, writing about Mithradates, seeks to "apply 'the scientific use of the imagination' to fill in the spaces between surviving accounts and contextual facts." Both authors present us, then, with new accounts of the most famous monarchs to make a last stand against the Roman takeover of the eastern Mediterranean. I have the pleasure to announce version 3.0 of JSesh. Thanks to M. Thomas' work, the full Manuel de Codage (or, in other terms, the "extended library") is now covered by JSesh (save a few signs here and there, which will be fixed in the near future). So JSesh 3.0 is essentially JSesh 2.13, but with complete X, Y and Z families. I thought however that a full coverage of the Manuel de Codage warranted a new version number. For those of you who have read the blog over the last year you'll probably have noticed the occasonal report about the massive refurbishment at the Ashmolean Museum (Oxford, UK), which lead to it being closed for a period. I went with a friend to see it on Thursday, to see the archaeological sections. The first thing to highlight is that the Egyptology section hasn't changed. One or two artefacts seem to have been moved around but that's all. The refurbishment did not include the four ancient Egyptian galleries are much as they were. Sadly the wall of Amarna relief fragments is no longer illuminated and they are almost impossible to see. We had a look at other archaeology sections that interested us both. The new design is modern, clean and attractive. The presentation of the objects themselves has changed considerably and I am very much in two minds about how successful that it actually is. My friend described the presentation as taking an art gallery approach, which really hits the nail on the head. Instead of showing lots of artefacts and giving a wide view of a place the new presentation takes the most attractie or remarkable of the collection and, with beautiful lighting, presents them as highlights of an area. Information boards help to describe the galleries, but there is a loss of the sense of variety and depth which the rather untidy layout surviving in the ancient Egyptian galleries still maintains. I found the new Ashmolean quite beautiful but much less informative. I would have liked to have seen a much better balance between attractive presentation cabinets and the volume and richness of displays you would expect to see in a museum so closely tied in with a research institution like Oxford University. I suppose that there's never going to be a way of pleasing everyone with such a dramatic re-invention. Kalabsha is the biggest of the Nubian Temples after Abu Simbel. the waters of Lake Nasser. in the temple as a falcon with a man's head. Kalabsha, which it shares with other re-homed monuments. Jennifer Smith, PhD, associate professor of earth and planetary sciences in Arts & Sciences at Washington University in St. Louis, was belly crawling her way to the end of a long, narrow tunnel. The tunnel was carved in the rock at a desert oasis by Egyptians who lived in the time of the pharaohs. What was she doing in the tunnel? The answer: seeking an uncontaminated sample of a mineral that might have been the key ingredient in the blue used to decorate “blue painted pottery” popular among the Egyptian elite during the New Kingdom (1550-1079 BC). Jane has kindly shared her notes from the latest Mummification Museum lecture again. Otto opened the lecture by reminding us that whatever KV63 finally turns out to be it will always be the first tomb discovered since the tomb of Tutankhamen. It started with a search for foundation deposits for the tomb of KV10. Excavation revealed 2 huts to the west and 10 huts to the east. These were used by the workman who lived in the valley and filled with ostracha and other artifacts. Theodore Davies had excavated the east most huts 10, 9 and 9a but left the central area. Under hut 5 they found KV63. Consisting of a single chamber with a stack of 8 coffins and 28 huge storage jars. This season they have been working on restoration of the coffins and the contents of the jars. Within these jars they have found natron, pots, textiles and the ‘embalming bed’ that is now in the mummification museum. Coffin B (please refer to the Kv63 website for identification and pictures) was in a dreadful state, split with its mask fallen off and laying face down. SCA conservators have restored it and put the mask back in place. This is slow and painstaking work like watching the grass grow. It is not a work of art (I thought the profile was nice) and there is no writing or decoration. It is nice to know that KV10 is not being forgotten! Desert ecotourism: what's in it for Egypt? Ecotourism is taking off throughout Egypt, boosting an economy already heavily dependent on tourism revenue. Bahariya is among those destinations increasingly popular for their pristine natural environment. However, Egypt is quickly learning the need for balance between environment and development, amid concerns that tourism is stressing the country's fragile ecosystems to the point of collapse. And the debate on ecotourism is even being had here, on the dusty streets of Bahariya’s largest village. Ali Abdel Salem, 58, has lived in Bawati all his life. He has fond memories of the days before an asphalt highway was built linking the oasis to Cairo. A trip from the capital that once took five days now takes only five hours. Bahariya Oasis, once a thriving agricultural center for the Roman Empire, is now the preferred stepping-stone and supply stop for tourists heading to the surrounding deserts. Newly discovered ancient temples set against a stunning natural backdrop is another reason tourism is increasing here. In recent years, the number of visitors to Bahariya has climbed so high that one-third of the oasis’ almost 40,000 residents are now working in tourism. Over the past decade, unemployment decreased as the number of hotels in Bahariya shot up 500 percent, according to Bahariya’s tourism office. Rarely-seen treasures from Anglo-Saxon England, Ancient Egypt and the Mediterranean are being opened up to public view following the refurbishment of the small museum of Girton College Cambridge. The Lawrence Room at Girton contains a range of unique pieces including Anglo-Saxon treasures recovered on the college site in 1881 and, perhaps most importantly, Hermione Grammatike, a named portrait mummy of a young female classics teacher from the Fayum city of Roman-era Egypt. Excavated by William Flinders Petrie during the winter season of 1910/1911 in the Roman cemetery at Hawara, on the eastern edge of the Fayum, Hermione has become something of a Girton icon. Thanks to the Resource Shelf blog for the information that the Edwin Smith Surgical Papyrus is now available online at the Turning the Pages Online website, from where you can load the virtual papyrus, or you can link to it directly by clicking here (it takes quite a while for the page to load). This is a terrific way of looking at the original papyrus. The Eye of Ra that shows under the papyrus allows you to zoom in on any part of it. The Edwin Smith Papyrus, the world's oldest surviving surgical text, was written in Egyptian hieratic script around the 17th century BCE, but probably based on material from a thousand years earlier. The papyrus is a textbook on trauma surgery, and describes anatomical observations and the examination, diagnosis, treatment, and prognosis of numerous injuries in exquisite detail. American archaeologist Edwin Smith discovered the papyrus in Egypt in the 1860s, and his daughter donated the papyrus to the New-York Historical Society after his death. It eventually made its way to the Library of the New York Academy of Medicine, and it was recently translated for the first time in over 50 years into English by James P. Allen of the Metropolitan Museum of Art in New York. If you speak Spanish this is a really nice introduction to the Petrie Museum of Egyptian Archaeology written by a recent visitor. It includes a history of the museum and gives a blow by blow account of the visit t the museum. It is accompanied by around ten good photos and a plan of the museum. MOST people associate museums with art and artifacts, not research libraries. But many of New York’s most prestigious museums have extensive collections of books and papers. Four of them — the Metropolitan Museum of Art, the Museum of Modern Art, the Brooklyn Museum and the Frick Collection — have combined forces to share resources, save money and make their holdings more accessible to the public. Together these institutions make up the New York Art Resources Consortium, an integrated library system formed in 2007 that is supported by grants from the Andrew W. Mellon Foundation. Its Web site, nyarc.org, just went on line in February. Last year, three of the museums united their collections in one catalog, called Arcade (the Met has kept its catalog separate). The database, at arcade.nyarc.org, is a trove of more than 800,000 records from ancient Egypt to contemporary art that includes exhibition and auction sale catalogs, monographs, periodicals, rare books, photographs and archival materials. J. Arch. Science - reservoir offset in C14 record? Available to journal subscribers, or by purchase for download. Some radiocarbon dates for ancient Egypt have been significantly offset from the established historical chronology (see Bonani et al., 2001). In this paper, short-lived plant species collected in Egypt between 1700 and 1900 AD were used to investigate the possibility that the radiocarbon record had been influenced by reservoir effects. AMS radiocarbon measurements were made on 66 known-age samples, resulting in an average offset from expected values of 19 years. The implications of this minor discrepancy on the likelihood of a reservoir process are discussed, and the agreement of the data with recent models of radiocarbon seasonality is also considered. This is the last of the photos from Beit el-Wali. There will be more from New Kalabsha in the next couple of weeks. NB - the photograph currently showing on the page is not from the site - it is not even from Egypt - but is part of a slideshow of general archaeology and anthropology photographs. A team of archaeologists unearthed two large red granite statues in southern Egypt at the mortuary temple of one of the most powerful pharaohs, who ruled nearly 3,400 years ago, the Culture Ministry said Tuesday. A ministry statement said the team discovered a 13 foot (4 meter) statue of Thoth, the ancient god of wisdom and the top part of a statue of Pharaoh Amenhotep III standing next to another god. Both were found buried in the pharaoh's mortuary temple on the west bank of the Nile in the southern temple city of Luxor. On Feb. 28, archaeologists discovered a massive red granite head of Amenhotep III at the same temple. Egyptian archaeologists have discovered a colossal ancient statue of the pharaonic deity of wisdom, Thoth, in the shape of a baboon, the council of antiquities said in a statement on Tuesday. The four-metre (13-foot) tall statue was discovered in four pieces along with two statues while workers were lowering ground waters beneath Luxor to help preserve the city's pharaonic temples, the statement said. It dates back to the 18th Dynasty, which ruled Egypt until 1292 BC. "It is the first time that a statue of Thoth, depicting him as a monkey, of this magnitude has been discovered," Mansur Boraik, head of pharaonic antiquities in Luxor, told AFP. This will probably be our last visit to Shirbin as we return on Friday to Cairo from where we hope to be able to return home, though at present we are booked on a British Airways flight on one of the days they are going on strike! We’re waiting for further information from BA as to whether or not our flight will be operating before we look for alternatives. In the meantime, we will just carry on working! Artur left us today to rejoin the Polish mission at Tell Mura, after several very successful days of magnetic scanning. The magnetic map of Yetwal is not as clear as that of Balamun as the surface is covered by small fragments of red brick and sherds so it is more difficult to see any underlying features but there are some buildings visible and this year we have SCA permission to carry out limited excavation to try and date the structures. So far they would seem, from associated red brickwork, plaster floor remains and a few diagnostic sherds to be of the Roman Period . His comments come as the Egyptian government recently completed the restoration of a number of Jewish synagogues in the country as part of the culture ministry’s efforts to bolster its past, the minister’s office said. Thanks to Jan Picton (Secretary, Friends of the Petrie) for the following information. The Friends of the Petrie Museum have received an unusual donation from PMF committee member, Gillian Mosely. Gillian is the Director of Medialab, a concept house that devises and sells factual television ideas to broadcasters including the History Channel, Channel 4, Five, Discovery, and National Geographic. Gillian and her cameraman, Christoph Steiger, donated their skills, time and editing expertise to produce a series of 23 short films about the Petrie Museum which we have now put up on UCL's YouTube channel. The voice-overs have been done by Richard Langley, our Operations Manager. Richard is leaving us this month and we wish him well. The films include a brief introduction to the museum, staff interviews, projects and objects. 12 separate films about Petrie, the museum, and Stephen's introduction to the collection and the his role at the museum.